Tips to paying off credit card: Save first. Why you should save BEFORE you pay off your credit card. Stop me if this story is sounding familiar. Each month you decide to pay off that credit card once and for all. You pour as much money as you possibly can onto it, hoping to make a significant dent. And you do, but by the end of the month the credit card balance has climbed right back up again! And so continues the vicious cycle. One step forward, two steps back. Pretty disheartening, right? Now, there are plenty of blogs out there that will advise you to pay off the credit card first before building up your savings. But not me. No way. And here is why. Sure, if you ask your high school maths teacher they will tell you that mathematically speaking paying off the credit card first is absolutely the right thing to do. After all, in the current market your savings are only earning you a measly 2% interest while you pay 15% or more on the credit card. It’s a no brainer, right? Watch: Kochie’s advice for teaching your kids how to manage money. Post continues after video. But, as I have said before, there is more to money management than pure math – otherwise, we’d all be rich! So if you have tried this approach before and it hasn’t worked, let me suggest something different. We know that our brain is a pretty amazing and powerful machine. What you may not know is that as you go through life your brain creates new neural pathways as you have different experiences and learn things so that it can operate more efficiently. What this means for your finances is that when you’re trapped in the cycle of credit card debt you have formed, over time, a strong neural pathway around debt (aka a habit). And each time you use the credit card or you think about that credit card you are strengthening that connection in the brain making the habit harder to break. What scientists have discovered though is that all hope is not lost and your brain has the ability to re-train or ‘rewire’ itself! This is called Neuroplasticity (and if you are after some interesting reading material I highly recommend Dr Norman Doidge’s book “The Brain that Changes Itself”). "There is more to money management than pure math – otherwise, we’d all be rich." Image via iStock. So, how do you "re-train" your brain? You need to stop thinking about debt, and start thinking about SAVING. What that will do is start to shift your focus and your habit from “debt” to “saving”. You want to form a new habit, and experts suggest you need about 21 days of consistent behaviour to do that. So over those 21 days, each time you decide NOT to use your credit card, each time you prioritise SAVING over SPENDING you are strengthening those new neural pathways. But to make sure you have really made the change I suggest giving yourself a longer timeframe. Instead of 3 weeks I want you to give yourself a goal of saving for at least 3 months (or however long it will take you to save up one month’s worth of living expenses). And while you do that, keep up with the minimum repayments on your credit card. Time to build up the savings. Source: Getty Images. Let&apos;s build up some emergency savings! Neuroplasticity aside, you need some emergency savings, especially while you still have debt. This is because you need to make sure that if you suffer a loss of income or any unexpected bills arise you are able to afford to meet your loan repayments and are not putting yourself into even further debt as a result of a temporary setback. Although I normally suggest my clients have 3 months of living expenses saved up for emergencies, while you still have credit card debt let’s go for 1 month first, and save up the remainder after the card (and any other personal loans) is paid off. 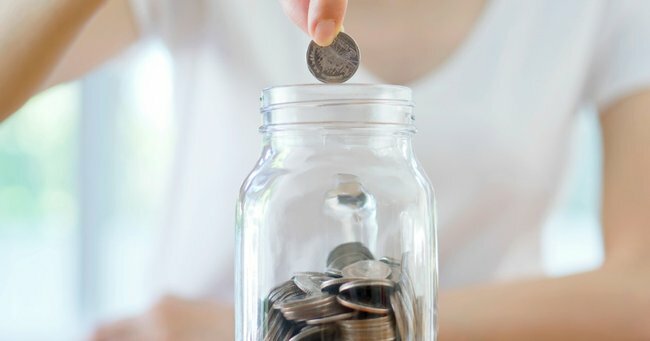 By doing this, not only will you be building up a nice little buffer, you will also be teaching yourself how to be a saver instead of a spender! Step 1. Image via iStock. No matter what, do not use the credit card! Watch your savings start to grow! Once you have reached your goal of 1 month living expenses you should have by now established a new habit, and have formed a new budget you can manage to sustain. So from this point, change your direct debit transfer from going to your saving account to the credit card until that debt is cleared. Then continue saving! If you have more than one credit card – focus on paying off the card with the smallest balance first and then close the account and move on to the next one. Seeing yourself make progress in this way will further help you to stay motivated. And if you ever find yourself struggling, our Facebook community is here to support you on your journey, so pop on over and say hi! This post originally appeared on Women With Cents. You can view the original post here.